Hamburgers are a camping staple just like hot dogs and marshmallows. 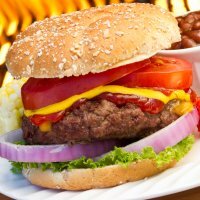 Here are some variations on the plain grilled hamburger recipes. Just gather and measure all the ingredients before you leave home, putting them in labeled Ziploc bags and your grilling preparations will be easy peasy. Medium Rare: 3 minutes on 1st side, flip hamburger, 4 more minutes on 2nd side. Medium: 3 minutes on 1st side, flip hamburger, 5 more minutes on 2nd side. Medium Well: 3 minutes on 1st side, flip hamburger, 6 more minutes on 2nd side. Well Done: 3 minutes on 1st side, flip hamburger, grill for 7 more minutes on 2nd side. Of course, the above is just a general estimate. It will depend on how thick your burgers are, how hot the grill is, how windy it is, etc. Combine first 7 ingredients. Shape into patties and grill according to chart above. Combine ground round, onion, oregano and garlic powder in a bowl. Chop the tomatoes into small pieces. Form the ground round mixture into patties around the cheese and tomatoes. Be sure tomatoes and cheese are completely covered by the meat. Grill pizza burgers according to grill time chart above. Place patties on lightly toasted buns spread with pizza sauce and top with sliced black olives. Mix meat and egg. Add onion, chili sauce, salt and pepper. Form the mixture into 3 or 4 patties and grill according to time chart above. Split buns and toast. Spread toasted buns lightly with mayonnaise. Wrap a hamburger, hash browns, cheese, (optional onions, green pepper, carrots) in foil. Place on grill and cook about 30 minutes, turning occasionally. 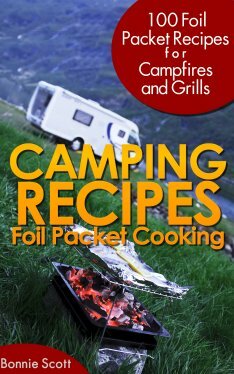 Be sure all ingredients are tucked neatly in the foil. Mix the beef, salt, and pepper together. Shape into flat hamburger patties. Split the hamburger buns and spread margarine generously on the buns. Grill hamburgers according to above grilling time chart. Combine the onion, parsley, margarine, Worcestershire sauce, salt, mustard, pepper, and cheese to make a smooth paste. Spoon over the hamburgers and grill a few seconds until the spread is melted. Grill the hamburger buns for a minute or so. Remove and serve hamburgers on buns. Add the liquid smoke and the egg, beaten, to the meat; season with salt and pepper, and mix thoroughly. Form into patties and grill. Mix the smoke butter ingredients together. Place patties on lightly toasted buns spread with smoke butter. Top with thin slices of tomato and onion. Press ground beef into very thin, flat patties between waxed paper. Put 2 patties together with a filling made from onion mixed with steak sauce; crimp the edges of the patties firmly together. Grill over the coals and serve in hot hamburger buns, split and buttered. Cheese slices can be used in place of the onion filling. Cook onions in margarine until limp, stirring occasionally. Add mushrooms and saute for a few minutes. Blend in flour, seasonings and sour cream. Cook over low heat 5 minutes. Serve as an accompaniment to grilled hamburgers. Yield: 6 servings. 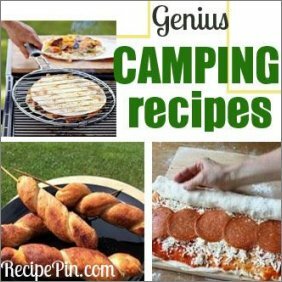 Mix all ingredients together and spoon on grilled hamburgers. Chop sweet and hot peppers together extra fine in food processor. Bring peppers, vinegar, mustard, salt and sugar to a boil, stirring constantly. Turn heat off and let cool for 5 minutes. Mix flour and water together in small bowl until all lumps are gone. Stir flour and water into pepper mixture and bring to an easy boil for 10 minutes, stirring constantly. Put in 1/2 pint hot jars while hot and let seal. Makes 6 pints. Good on hot dogs and hamburgers. 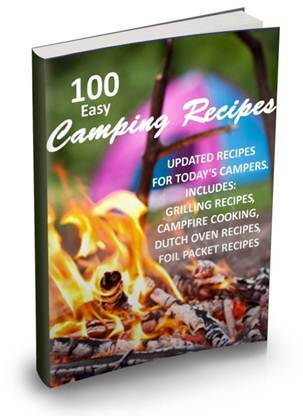 Disclosure Statement : I am an affiliate of the products recommended on CampingFreebies.com. � Copyright 2016. All Rights Reserved.